The Kansas National Guard Service Member and Dependent Support Team, directed by Mary Nesbitt, is a program that provides training and assistance to Guard families to help them with their quality of life, as well as with the pressures of separation and reunion. Though the Family Assistance Centers primary focus is Guard members and their families, they also cater to the needs of military families from all branches of services. 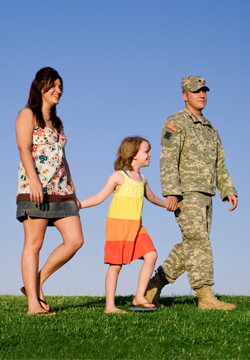 Family Readiness Groups are officially Guard sanctioned groups consisting of families and friends of the National Guard. Training is offered throughout the year to those families of deployed Guard men and women and other volunteers. The Kansas National Guard Youth Program is designed to support the needs and development of youth whose parents serve in the National Guard and other branches of the military. Personnel consist of one State Family Program Director; two Airman and Family Readiness Program Managers; one Family Program Specialist; one Family Program Assistant; one Senior Family Readiness Support Assistant; three Family Readiness Support Assistants (located in Wichita, Hutchinson and Topeka); one Family Assistance Center Coordinator; six Family Assistant Center Specialist (located in Wichita, Salina, Iola, Lenexa, and Hutchinson); two Military Family Life Consultants; one Lead State Youth Coordinator; one State Youth Coordinator; one Military One Source Consultant; one Personal Financial Counselor; two Transition Assistance Advisors; one Sexual Assault RSP Coordinator; two Survivor Outreach Services; one Yellow Ribbon Event Account Manager and two Employer Support of the Guard and Reserve. Facilitate discussion groups and peer support groups to assist family members in dealing with emotions and responsibilities that they assume when their Guard member is away. The main focus of the Service Member and Dependent Support Team is on the Guard members and their success to their mission, knowing their loved ones’ needs are being met at home.